'Lost In Space' Reboot Gets Lost In Repetition Netflix's remake of the campy 1960s series is everything that show was not: dark, suspenseful, with great-looking special effects. It gets a bit repetitive, but it's worth sticking with. In Netflix's new Lost in Space, young Will Robinson (Max Jenkins) faces danger. Again, and again ... and again. Over the course of its run, the focus of the show shifted from the family to that weaselly doctor. Looking back, it's easy to see why: The family was a bunch of white-bread squares in matchy-matchy outfits, but the doctor – played with a sublimely mincing menace by Jonathan Harris, was a revelation. The character of Doctor Smith was vain, overdramatic ("Oh, the pain, the pain! "), selfish, self-pitying, self-aggrandizing – a campy, eminently hissable villain out of a Christmas panto, down to the clipped British accent (which was something the Bronx-born Harris sniffily affected). Alongside young Bill Mumy's Will Robinson and the show's most expensive prop — a robot given to shouting "Danger, Will Robinson!" any time Will Robinson found himself in danger, which was weekly — Doctor Smith rounded out what became the show's silly, kid-friendly core. It was one of the first examples of a television series undergoing a shift in emphasis that would come be known, years later, as an Urkeling. But let's talk about how great it looks. The special effects are hugely impressive, the sets suitably grand and meticulously detailed, and the exteriors so gorgeous you'll do that thing where you wait for a talky scene to visit the show's Wikipedia page to find out where it was filmed. Those of us who view the original Doctor Smith as a queer icon remain fiercely protective of the character, and when this Netflix series was first announced, I can assure you that there was some consternation among the faithful. Upon learning that role of Doctor Smith would be assayed, in the new series, by Parker Posey, well. Let's just say that in some select quarters there was a great and vigorous nodding of heads. "Yes." "Sure." "Makes sense." "No, I mean, obviously." Posey's great in the role, of course — she plays the woman as a raw, exposed nerve that's learned how to conceal itself behind bland niceties and simpering grins so as to fit in. In her every interaction with another character, you can see her probing for weak spots and exploitable information. It never quite slips over into camp, but it's so close you can smell the s'mores. Happily, the once-bland Robinson family has gotten a much-needed upgrade. The Robinson women, who spent most of the original series cooking or falling in love with dashing aliens, are fully individuated: Eighteen-year-old Judy (Taylor Russell) is a capable medical doctor; younger sister Penny (Mina Sundwall ) is a sardonic rule-breaker; and — in perhaps the show's smartest move — mother Maureen (House of Cards standout Molly Parker) is a brilliant scientist whose strict, uncompromising expectations of those around her are continually frustrated. Parker makes the most of this, imbuing her portrayal with a poorly concealed, constantly simmering exasperation. For a show built on bingeability, however, the series' format — the Robinsons find themselves in dire, inescapable straits, and proceed to dutifully escape them — soon grows repetitive. A reliance on natural disasters to raise the stakes — a collapsing glacier this week, a cataclysmic storm the next — may be the showrunners' homage to O.G. producer/disaster-movie schlockmeister Irwin Allen, but it causes the characters to hit the same beats, again and again. It takes a long time (over half the season) for all of its disparate players — including Ignacio Serricchio's charmingly grizzled, charmingly unheroic Don West — to finally come together. Young Will Robinson (Max Jenkins) is perfectly fine here, but the show is content to merely insist upon his close relationship with the robot, instead of fleshing it out. As a result, the screentime they share — which is considerable — never quite lands with the weight it's intended to. At times, the show's particulars owe so great a debt to other sci-fi properties you may fleetingly wish you were watching them instead. (The robot toggles between friendly and aggressive modes? The Iron Giant! A charismatic doctor has a selfish, lily-livered agenda? Battlestar Galactica!) But if you can stay with it through the later episodes, the quarrelsome Robinson family and their various hangers-on grow more layered and cohesive. 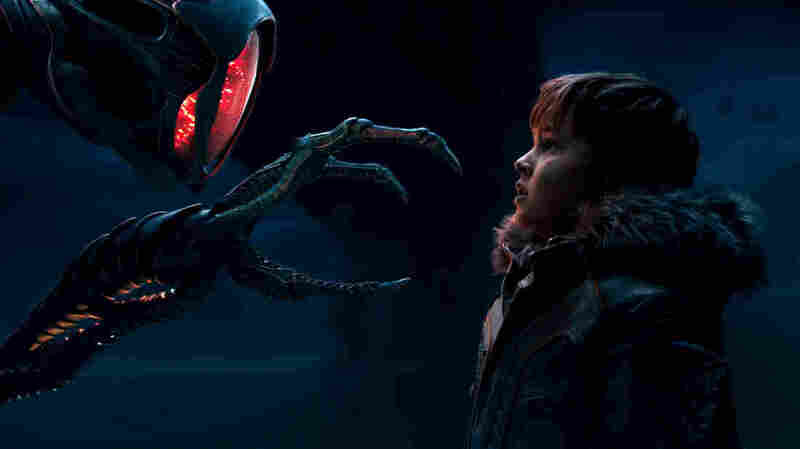 If Lost in Space gets a second season — which seems likely, given the sunk costs Netflix has expended on set construction alone — here's hoping Parker Posey's snaky Doctor Smith and Molly Parker's suffer-no-fools Maureen get more to do.